iPhone 8 | How Do I Transfer Photos from PC to iPhone No Data Loss? How Do I Transfer Photos from PC to iPhone 8/7/6s or Earlier? Due to the close-end nature of iOS system, how to transfer photos from PC to iPhone used to be a daunting task when iTunes for Windows was a must-have. However, with more pictures, images uploaded to the Cloud server & helpful 3rd-party tools were onstage to help, it's only a matter of click and done to transfer photos from computer to iPhone. How do you import photos from PC to iPhone 8, or vice versa? Check out to see if you're working with the fastest tool! How to Transfer Photos from PC to iPhone? Backward transfer photos from iPhone to PC. Compared to the out-of-the-box AirDrop way to transfer photos, pictures from Mac to iPhone, Windows users may have a bit more difficulty working on PC to iPhone 8/7/6s transfer. What if there are cases where you need a picture to go mobile, or import a digital paintwork to iPhone so as to carry it with you? From the 4 method to transfer photos from PC to iPhone, we place free DearMob iPhone Photos Manager on top of the list, and below is how you can import pictures with it. Please always work with an original Apple USB cable, in that data transfer between PC and iPhone may go wrong through inferior cables. DearMob iPhone Photo Manager also supports transferring GIF pictures from computer to iPhone, which can play on iOS 11 iPhone 8. If you're trying to transfer photos from iPhone X/8/7 Plus/7 powered with iOS 11, and would like to view the them on Windows 10/8/7 now and then, you'll need one of the top 3 HEIC converters 2019 as HEIC HEIF photos won't natively open on Windows computers. How Do You Transfer Photos from Computer to iPhone? Step 1: Download free photo manager to computer (Windows 10 supported), install and launch it BEFORE you USB connect iPhone to computer. Tips: Unlock iPhone and tap "Trust" when the trust request prompts out. Step 2: Check on New Album on the left-hand bar, then hit "Add Photo", or "Add Folder" to upload all the pictures save to one address. This step is revocable. Step 3: When uploading is successful, click on "Sync" to transfer photos from PC to iPhone. Please visit how to transfer photos from iPhone to computer if you'd like the transfer to be done in the opposite direction. Step 1: Visit WeTransfer website on PC, upload the photo(s) you want to transfer from PC to iPhone. Note that a maximal number of 10GB photos are allowed to be uploaded once. Step 2: Type your own Email account into the "receiver" blank, and click "Send". Step 3: On iPhone, log-in with the same Email account - download the photos you sent from PC using WeTransfer. In this way you can frankly transfer photos from PC to iPhone. Uploading photos to WeTransfer might take a while depending on the network condition. If you're considering faster importing photos from PC to iPhone, take a look at iPhone transfer guide. Irrespective of how long it may take to transfer photos from PC to iPhone, iCloud Photo Library remains one of the best tools get photos moving & transfer photos from PC to iPhone 8 in a way we call "syncing" - which helps if you need the pictures to be transferred to other iOS devices logged-in with an iCloud account. I'll outline below as of how to set up iCloud Photo Library on Windows & how do you transfer photos from PC to iPhone after uploading them to iCloud Photo Library. Step 1: First launch iCloud for Windows, next to the Photos icon, click "Options", then check iCloud Photo Library, then click on "Done" > "Apply""
Tips and Notes: Make sure that your iPhone is running the latest iOS before turning on iCloud Photo Library on iPhone. Step 2: On iPhone and iPad, visit settings > your name > iCloud > Photos to turn on iCloud Photo Library. 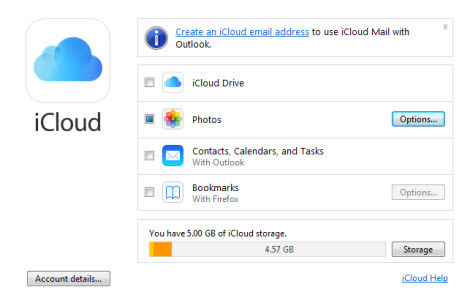 How to Upload Photos to iCloud Photo Library? Step 3: Open any File Explorer window, find "Favorites" on the right-side menu, where you can visit iCloud Photos. Step 4: Click "Upload photos and videos" on the top menu bar, check the photos you want to transfer. 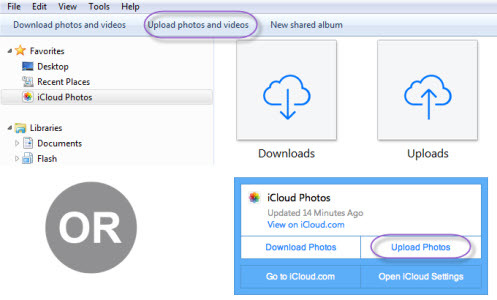 You may also right click on the iCloud icon in Windows taskbar > Upload photos to transfer photos from PC to iPhone, which also indicates the process of uploading. 5GB of free Cloud Storage is associated with every Apple account, so you'll need to upgrade Cloud Storage if planning to get a backup of all photos. 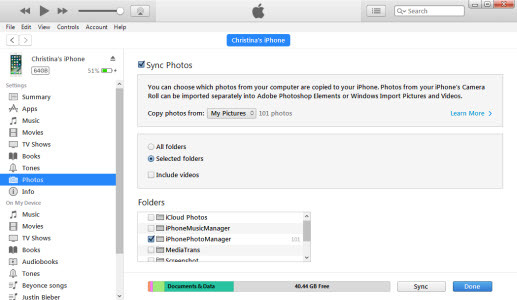 How Do I Transfer Photos from Laptop to iPhone with iTunes? Transferring photos from computer to iPhone involves less flexibility: every time you initiate a complete transfer, iTunes replaces the photo library on iPhone with the version of iCloud Photo Library on computer. So this method requires you to import the part of photos on iPhone that aren't on your PC in order not to lose them. 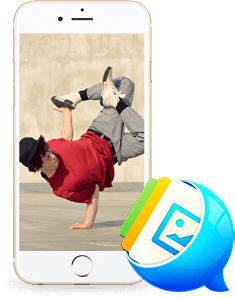 In that term, DearMob iPhone Photo Manager will help save a lot of time if what you need is a separated & clean way of transfer, instead of a cohesive iTunes syncing that may wipe out iPhone albums if not upload to PC beforehand. Step 1: Import iPhone photos that aren't on your computer. Step 2: Upgrade to the latest version of iTunes, and USB connect iPhone to PC with an official Apple's USB cable. Unlock iPhone with your passcode, then tap "Trust this Computer" to let iPhone recognized by iTunes. Step 4: If you also need the videos, check "Include videos". When photos are all checked, hit "Apply". Amongst all 4 ways to transfer photos from PC to iPhone, DearMob's free iPhone Photo Manager and iTunes could finish the transfer irrespective of network conditions. 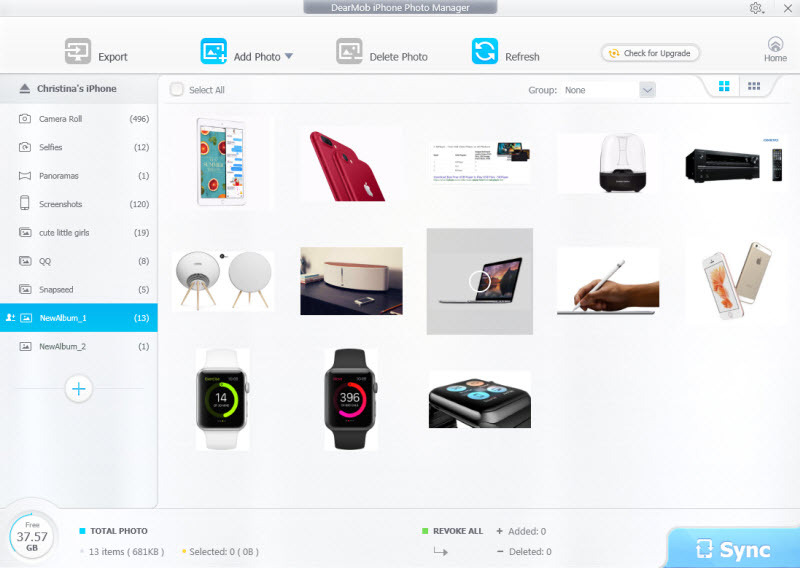 WeTransfer and iCloud Photo Library, however, enables you to work without a cable. How do you transfer photos from PC to iPhone given all the method introduced above? The free iPhone photo manager proves to be extremely helpful if you're to batch transfer 4K pictures, wallpapers, etc from PC to iPhone 8, or backward export photos from iPhone to Windows. Now free download to give it a spin!